Three days after his assassination, president John F. Kennedy was laid to rest with full military honors at Arlington National Cemetery in Virginia. President Lyndon Johnson’s first proclamation as the new president was to declare November 25th as a national day of mourning for the slain president. Most assumed that JFK would be buried in the Kennedy family plot at Holyhood Cemetery in Brookline, MA, just outside of Boston. Many of the national newspapers were speculating as much, but nothing was decided until Jacqueline Kennedy made her wishes known. When the young widow was asked her preference for burial arrangements, she stated simply, “He belongs to the people.” Mrs. Kennedy also requested her husband’s service be modeled upon President Lincoln’s funeral. After inquires were made, it was established that Arlington National Cemetery had a suitable spot for President Kennedy’s final resting place that would be accessible to the American people. The plot was midway on a slope heading down from Arlington House, with a panoramic view of Washington D.C. In March of that year, President Kennedy had stood on that slope after visiting the Arlington House mansion, and remarked to Park Service employee Paul Fugua and Charlie Bartlett that the view was so magnificent he could stay there forever, making the choice an easy one. At 3 p.m. on November 25th, John Fitzgerald Kennedy’s state funeral, a Catholic committal service performed by Boston’s Archbishop Richard Cardinal Cushing, got underway. 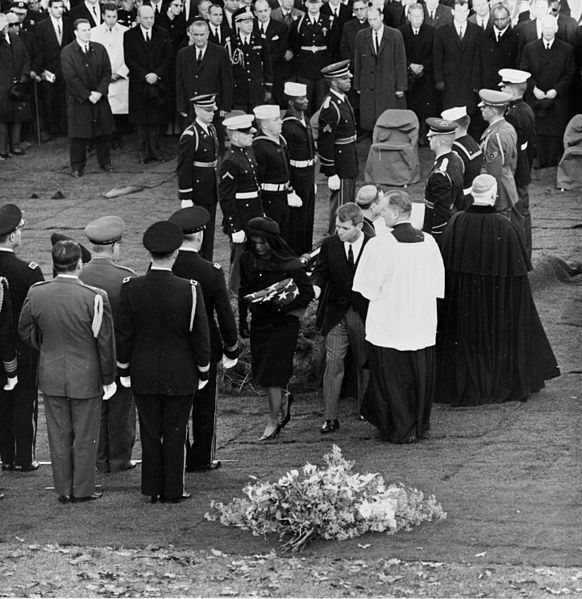 During the funeral, Mrs. Kennedy lit an “eternal” flame in her husband’s memory, which rests in the center of a circular five-foot wide granite stone at the head of the grave. The burner was designed so the flame would immediately relight in the event of heavy rain or wind, or any sort of mishap. Since then, there have been several instances of the flame being extinguished. For instance, in December of 1963, a group of Catholic schoolchildren were sprinkling holy water over the grave when the cap came off the bottle and put the flame out. A nearby cemetery official quickly relit the flame. A heavy downpour proved to be too much for the flame in August 1967. The storm shorted out the electrical transformer that powered the flame’s spark igniter as well, so the flame couldn’t be relit until the rain subsided, and a cemetery worker could do the job by hand. The president (and his two deceased infant children, Patrick and Arabella, who had been re-buried next to him) were joined by more family members over the years. His younger brother, Robert, was also taken too soon by an assassin’s bullet in June of 1968, and was laid to rest close to his older brother. In 1994, Jacqueline Kennedy Onassis died of cancer and was buried beside her first husband. Senator Ted Kennedy, the youngest of the Kennedy brood, passed away from brain cancer in 2009, and rests not far from his older brothers.